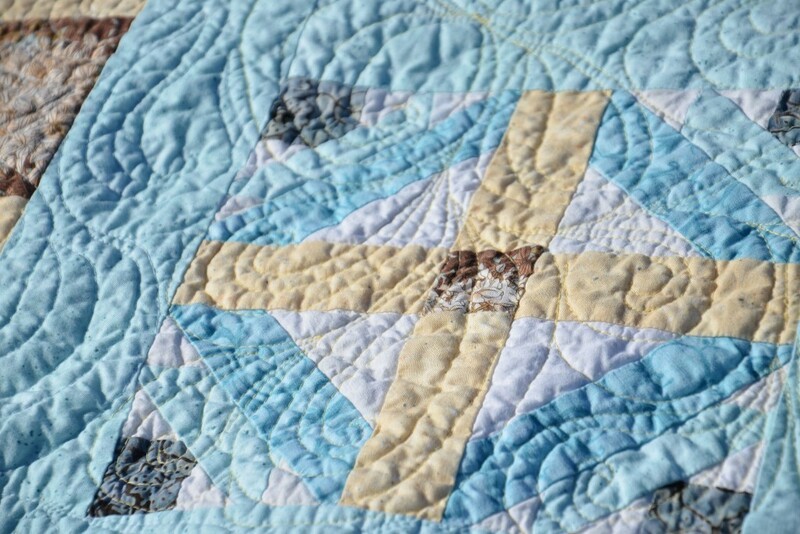 There are days I’m incredibly grateful that my first attempts at quilting didn’t scare me off forever. Case in point, my very first ever quilt project. I decided to make up my own bed-sized pattern using two different versions of the Altar Steps block that are both pretty fiddly (one had set-in seams, people. I don’t even like those now! 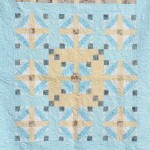 ), using fabric purchased from a box-store that shifted all over the place. It was a recipe for disaster. “Altered Steps” (detail), Rachael Arnold, August 2015, 54″x68″. Photo by Carl Pfranger. Somehow, I managed to complete 10 blocks (nine of one, one of the other), although there’s about a 1″ difference in size between them all. I clearly hadn’t read about chain piecing, judging by thread tails. I cut things incorrectly but still used them. I really have no idea what I was thinking. At some point, I came to my senses and moved on to a different project. In my effort to clear out old works in progress (for fear of being that quilter who has 20-year-old unfinished projects hoarded away in corners of their home—not that there’s anything wrong with that if you’re so inclined, it’s just not a good thing for me, personally—, I pulled out the blocks and decided to do something with it all. My self-imposed restraints: use up as much of the uncut yardage as possible, use all ten blocks, and don’t purchase any new supplies (no quilting thread, no batting, no backing—all stash). “Altered Steps”, Rachael Arnold, August 2015, 54″x68″. Photo by Carl Pfranger. 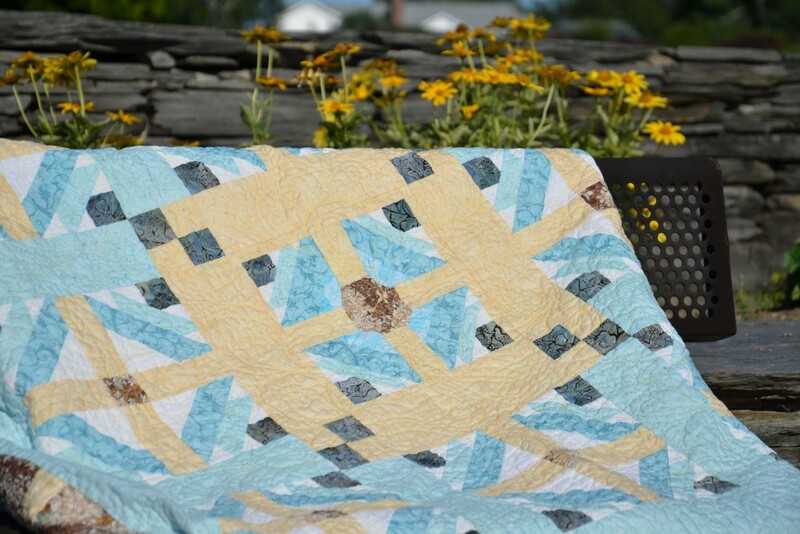 I knew from the start that there was no way I’d actually make the originally planned quilt—not with these cheap, poorly cut, questionably coordinating fabrics. I also knew that I wanted to do something fast so that I could move on to a project I was in love with, not just in love with the idea of getting out of my sewing and head space. 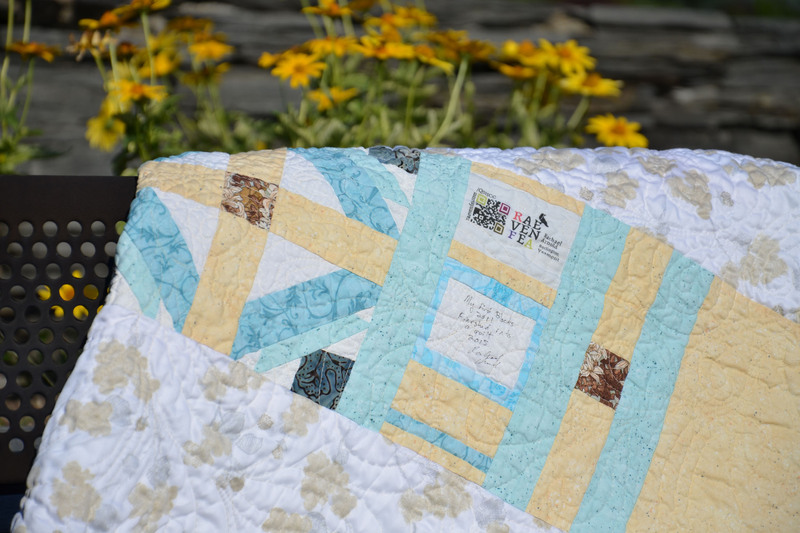 With wide sashing and overly large borders, I managed to use up most of the yardage, a small chunk of pieces that had been cut out (mostly the flowered 5″ squares and yellow strips), and nine of the blocks. The remaining yardage, block, and a few additional scraps made it onto the back and into the binding. The quilt finished at 54″ x 68″—a very respectable throw size, considering what I was working with. “Altered Steps” (back), Rachael Arnold, August 2015, 54″x68″. Photo by Carl Pfranger. I backed it with the second sheet of the set I used when making the Bird’s Nest quilt, plus a strip of piecing. I used 80/20 batting, since that’s what would work from my stash (I only had to piece it once). This is the first time I’ve gone directly from quilting 100% cotton to 80/20 the next day, and I did notice a pretty clear difference in loft while quilting: the 80/20 is not nearly as flat. 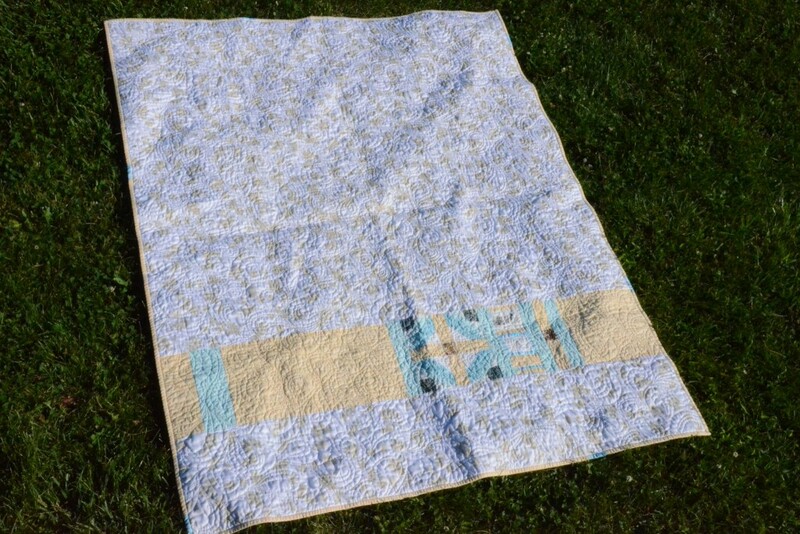 I think I would have preferred 100% cotton for this particular quilt, but it washed up beautifully in the end. “Altered Steps” (back detail), Rachael Arnold, August 2015, 54″x68″. Photo by Carl Pfranger. It’s quilted using a blown-up, much less well-controlled version of the “Flourish” design from the book Step-by-Step Free Motion Quilting by Christina Cameli (thanks Mom). 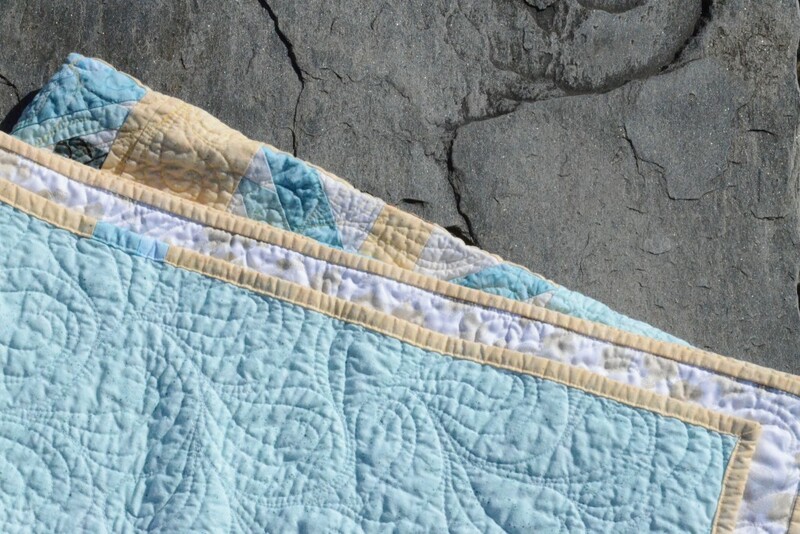 The center is quilted using two similar light yellow cotton threads (because I didn’t have enough of one for the whole thing), while the borders (roughly) are quilted using a light blue (I had about 18″ left on the spool when I finished—talk about cutting it close). The bobbins are a mix of yellow and whatever light beige I had on hand in quantity. I used up the last of the yellow blender and a few more cut pieces as binding, finished by machine. 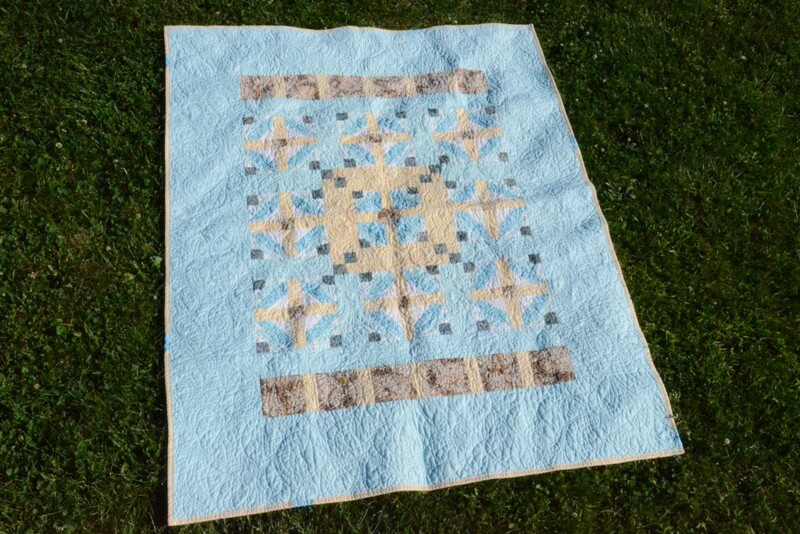 Five years and 36 other quilts later, it feels great to have a finished project made from those very first blocks along with a stash that is three yards of fabric (that aren’t my style) and a sheet lighter. 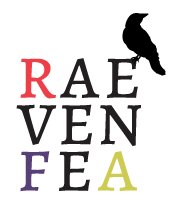 A part of me looks at this and asks “could I have done something more edgy, more modern, more creative, more my style,” but another part is happy to have something that went from boxed in pieces to pieced and basted in under a week. There will always be another project to be more innovative with. 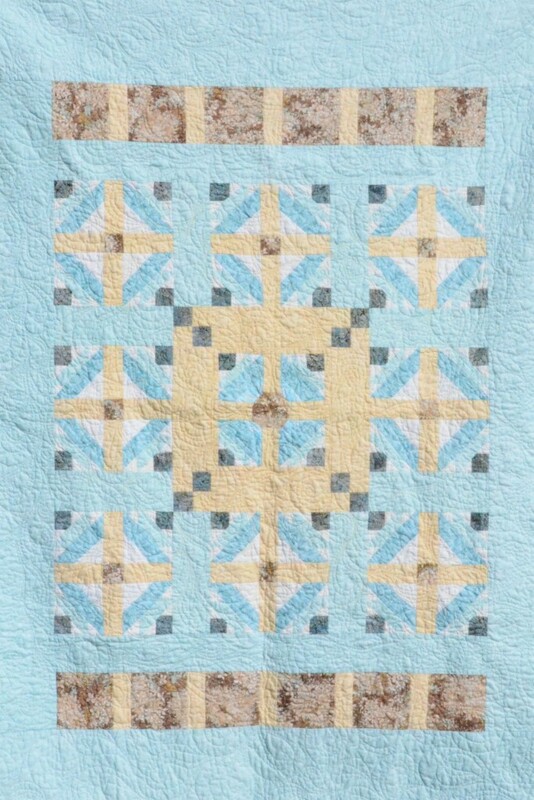 Now to decide if the quilt needs a home or should stay at mine.